The State College Spikes, Centre LifeLink EMS and B94.5 FM are once again teaming up to present this year’s safest and most fun children’s trick-or-treating event in the State College area. The Third Annual Safe & Seen in the Ballpark will take place on Sunday, October 26 from 4-6 p.m. at Medlar Field at Lubrano Park, the home of the Spikes. This free admission event is designed for young trick-or-treaters and their parents and will include many fun activities for children and their families. Each child is invited to wear his or her favorite Halloween costume and bring their bag or bucket to be filled by area non-profit agencies or community supporters stationed throughout the ballpark. Trick-or-treaters will be invited to go “door to door” to visit each participating group to collect treats and other fun items. 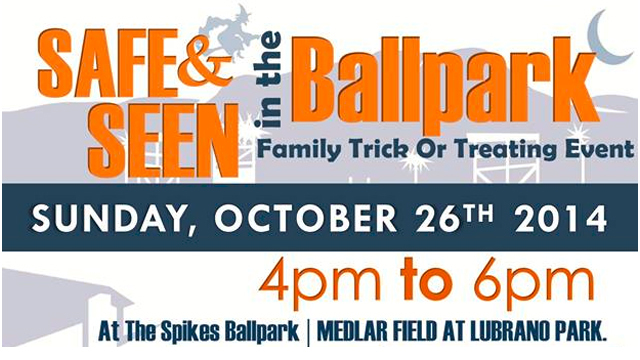 Families can also enjoy ambulance tours, fall crafts, kids games, meet and greets with Spikes mascots and more. The event will be held rain or shine as most of activities and trick-or-treat stations will be under cover. Anyone attending the event is encouraged, but not required, to bring a donation for Centre LifeLink EMS in support of their life-saving services.